Window graphics depicting scenic landscapes, like this one, installed in a patient room in the Surgery Intensive Care Unit, help make rooms feel more appealing and welcoming, which aids in the healing process. With all the talk about convergence in recent months — i.e., print providers expanding into new market segments — it is easy to assume that the only way in-plants can enter a new market is by adding new equipment, such as an inkjet press or wide-format printer. But the reality is that convergence can also mean using existing capabilities to go after new applications or verticals a shop has never tried before. 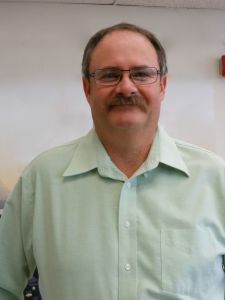 Larry Mills oversees Regional Health's in-plant, in Rapid City, S.D. That is the path that Larry Mills, manager of Printing Services at Regional Health in Rapid City, S.D., has taken. With his in-plant’s two staff members, Mills serves a network of more than 40 health care facilities, including five hospitals, across 20 communities in the Black Hills region, producing an average of 1.2 million impressions per month. But when one of Regional Health’s nurse managers approached him looking for ideas on how to make patient rooms feel more appealing and welcoming — specifically the windows — Mills started to think about how he could use the in-plant’s wide-format equipment in new ways. One idea was to transform the windows of several rooms — which looked out over rooftops with air-conditioning units — by printing colorful graphics on window film showing scenic landscapes, which would help brighten patients’ days. Working with a local supplier, he experimented with different materials and eventually decided on the General Formulations Concept 790 AE Etched Glass Air Egress Film, a grey frosted privacy film. Running the film on the in-plant’s Roland VersaCAMM VS-640, the shop produced pieces showing scenic landscapes. The project took about two months from start to finish, and began with just six rooms, but another eight are now in the design phase. Each room has a unique set of graphics, with all of the photography done by one of the doctors on staff. There is even now talk of bringing the concept to rooms without windows to expand the project even further. Mills notes that it didn’t take much to convince the decision makers at Regional Health to agree to the test run. “Once [it was] explained what we were doing, everyone immediately jumped on board,” he says. The only limitations Mills had in place were those that his 64˝ printer imposed, considering some windows were taller than that. To overcome that challenge, Mills worked with the nurse manager to come up with a solution; every window has a shade on it, which can be pulled down to cover the part of the window not covered with the film. Also, security wanted to ensure there was still a way to see out of the windows if necessary, so this solution solved more than one issue. 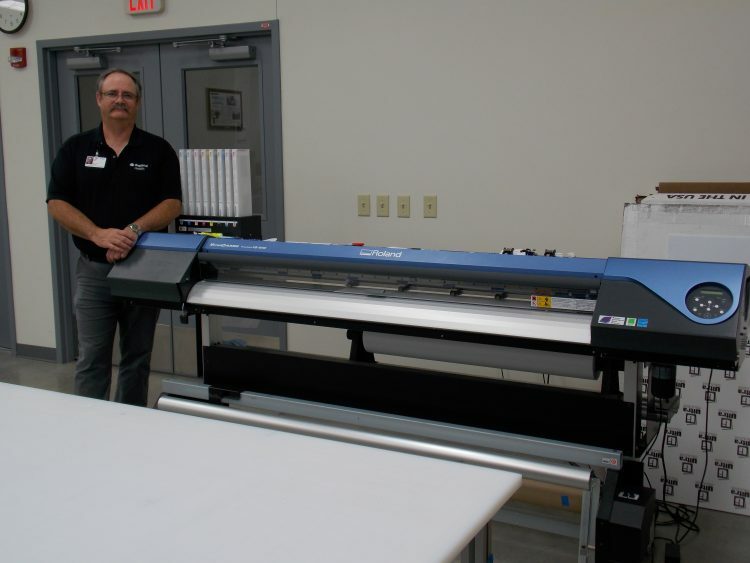 Larry Mills, manager of Printing Services, stands with his in-plant’s Roland VersaCAMM VS-640, used to produce window graphics and other wide-format projects for Regional Health. “Everything just fell into place,” Mills says. The film is rated for seven years, and Mills estimates that with the sunlight exposure, hospitals will likely get about five years out of the graphics. He is now focusing on how to expand the program to other areas of the hospital, with ICU and the cancer care center as the primary targets. Studies have shown a clean, pleasing environment aids in the healing of patients. So the window graphics are just another way to help make cold, intimidating hospital environments feel more welcoming across the board. The in-plant has been printing wide-format graphics since 2003 — posters, banners, trade show materials ­and perforated graphics used on glass windows throughout the facilities — but Mills has never tackled a project like this before. One of the biggest challenges he faced was a lack of anyone on staff with experience installing larger-scale window films of this type. “That’s one of the big roadblocks for me, not having an installer,” Mills says. For the pieces completed thus far, he has gotten around the problem by hiring installers from the local community to come in and take care of it for him. However, he is currently looking at the cost of outsourcing that job, to see if he can justify adding a permanent installer to his staff. At the moment, he says, the in-plant is putting some logos on those vehicles, but only as time and weather allow. He envisions being able to do full vehicle wraps that can act as moving billboards throughout the communities, helping to further brand Regional Health. Mills advises other in-plants to try new things with the equipment currently on their shop floors. He urges all in-plant managers to start collecting data about what can be improved about the overall experience throughout their parent organization. Stay involved with the core business, and understand who the end customer actually is — and how they can be better served. “This allows you to look forward and tailor your shop to stay relevant with the organization,” he notes. Convergence isn’t about jumping into new markets just to be there — it is about expanding into new applications that can give an in-plant far more options than might be apparent at first glance. Regional Health is the perfect example of taking the current equipment and asking “what else can we do?” With a little ingenuity and determination, new opportunities can be found by looking out the window.